Factory style 2 piece top with three plastic windows. Handrolled binding and original style elastics. We offer it in the Stayfast canvas. Canvas top seams are sewn. Vinyl/plastic windows and glass windows are DOT rated. Robbins is the preferred brand used by professionals. Robbins tops are known for quality workmanship and precision patterns. 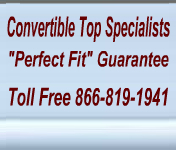 The Mercedes convertible tops have excellent workmanship, superior fabrics and attention to detail that will ensure you will enjoy your convertible top for a very long time. for your new Mercedes convertible top. 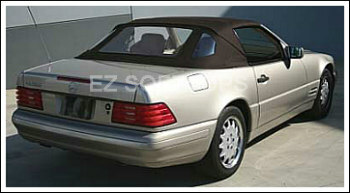 This top fits the 1990 Mercedes SL convertible, 1991 Mercedes SL convertible, 1992 Mercedes SL convertible, 1993 Mercedes SL convertible, 1994 Mercedes SL convertible 1995 Mercedes SL convertible, 1996 Mercedes SL convertible, 1997 Mercedes SL convertible, 1998 Mercedes SL convertible, 1999 Mercedes SL convertible, 2000 Mercedes SL convertible, 2001 Mercedes SL convertible and 2002 Mercedes SL convertible.